Nashos who want to make contact for lost mates. I was in the second Nasho intake at Kapooka October 1967, but I do not recall what platoon I was in. I remember a Sergeant Daly, Corporal Ted Little, Cpl Nitschke (? ), maybe Platoon Commander was a CMF bloke called Doyle (?). We were in Silver City. If anyone can help with any details, photo, etc. it would be appreciated. Email moc.liamg|7102etihwyrrek#moc.liamg|7102etihwyrrek For anyone who may be interested, I went on to join 3 RAR at Woodside and later 5 RAR first tour as a reinforcement. James McGhee Looking for Intake Photos. 3TB 1st Intake 22 Platoon E Coy 1971. 16 National Battalion South Australia. Is looking for any photos of the year he was in. He was in 2RTB A company 5th platoon 4th Intake 1966. Pucka. The Abbott Government instructed an impartial Tribunal to investigate the onerous criteria for awarding the Vietnam Campaign Medal. The inquiry posted a negative recommendation to the government in June 2015. It did not recognise the special conditions that applied to the National Servicemen who were compulsory called-up, under the threat of jail for two years, sent them to a foreign country to fight oppression, were prepared to die and then sent them home again because their jobs were at stake. Just because these combat soldiers did not serve at least 181 days they are ineligible for the medallic award. These same men completed the workplace terms of their contract to the government and have since been ignored. In addition the government issued some 3,000 of these same medals in error and has no desire to recall them. Precedents are in place not to usurp a Vietnamese government that folded over 40 years ago. Please contact your local Federal member anywhere in Australia & ask them to lobby Hon Darren Chester and Hon Kevin Andrews. Tomorrow is Vietnam Veterans Day and wouldn't it be fantastic to hear a positive public announcement. Could you please go to link and sign also share with your family and friends. Looking for images of the 15 NSTB F Coy 23 Platoon 2nd Intake 1952 intake. on behalf of father Anthony Clive Matheson (known as Clive and nicknamed Titch during his time as a Nasho). He served his initial training commitment at Puckapunyal followed by three years in the CMF - Royal Australian Corp of Signals at Albert Park in Melbourne. Any intake or personal photos we could share would be great. My name is Kylie Nathan and I am currently completing a research study, in partial fulfilment of the requirements of the Masters of Psychology (Clinical) degree at Swinburne University of Technology. The aim of the project is to identify the symptoms and behaviours that are noticed in veterans post-deployment and which symptoms and behaviours are of greatest concern. This will help in assessing the level of knowledge and use of support and treatment networks that currently exist. It is hoped that this research will also assist in identifying any barriers to help-seeking. Thank you for taking the time to read about the project – your contribution is greatly appreciated. In order to participate in the project, you must be over the age of 18, and the partner or close family member (i.e. parent, sibling, child) of someone who has been deployed overseas by the Australian Defence Force (ADF). What will my participation involve? If you decide to participate in the study, you will be asked to complete an online survey, which will take approximately 10-15 minutes. The survey is divided into two sections. In the first section, you will be asked some general questions about yourself such as your age, gender, and education. You will also be asked to provide some basic demographic and service/deployment information about your partner/family member (the ‘veteran’). You will not be asked to provide personally identifiable information (e.g. name, contact details), as it is the intention of the researchers that your participation in the study, and the survey responses you provide, remain anonymous. The second section of the survey consists of ten questions which ask about any symptoms or changes in behaviour that you noticed in the veteran post-deployment, what symptoms or behaviours would be cause for concern, the extent to which you and/or the veteran have sought help from the available services, and any gaps that you have observed between service need and service availability. Do I have to participate? Participation in the study is entirely voluntary – you are under no obligation to proceed with the survey, and even after you have started the survey, you can withdraw simply by closing your browser without completing all survey questions. As personally identifiable information is not being collected, consent to participate in the study, and for your responses to be compiled and cited in reports and/or publications related to the project, is implied by submitting a completed online survey. Are there any risks to participating in this study? It is anticipated that this study will increase our knowledge of the behaviours and symptoms that are concerning to the partners and family members or serving and ex-serving members, and decrease latency in seeking treatment. For these reasons, we are grateful for your contribution, if you decide to participate in the study. · Confide in someone else that you trust, such as a friend, counsellor, or minister. o Public mental health services for adults and children can also be located by suburb on the Department of Health site specific to your state or territory. · Lifeline (13 11 14) offers telephone support 24 hours a day, 7 days a week. You may also find after completing the survey that you would like some more information about the symptoms or behaviours described in the questions, or would like more specific support for yourself, the veteran, and/or your family more broadly. You may find it helpful to speak with the Veterans and Veterans Families Counselling Service (VVCS) or the unit padre. In a crisis, or if you or someone else is at risk of harm, please call 000 or attend your local hospital. What will happen to the information I give you? All survey responses are anonymous and cannot be linked to an individual study participant once the completed survey is submitted online. At the end of the study recruitment period, all survey data will be collated in a password-protected file, and stored on a network whose security measures comply with the highest industry standards. This file will be accessible only to the study investigators named above. Once data analysis is completed, the password-protected data file will be downloaded to a portable device and kept in a locked cabinet for a period of five years. At the end of this period, the data will be permanently deleted and the device destroyed. It is the intention of the researchers that study findings will be summarised in a thesis, and submitted for publication. In each case where data is cited, this will be done in group format, such that the anonymity of individual respondents is preserved. As the researchers are unable to identify participants, a copy of the final thesis and/or recommendations that arise from the study cannot be distributed to study participants. Interested parties are, however, welcome to contact the researcher supervisor, Dr Klaire Wallace, and request a copy of the final report without disclosing the extent of their participation in the research. Who do I contact for further information about the project? Swinburne University of Technology, P O Box 218, HAWTHORN VIC 3122. If anyone has a photo ~of16 Platoon D Coy 2RTB 3 Intake 1970. Terry would like a copy of his Platoon Photo, and contact with any Platoon members. 16 Platoon D Coy 2RTB 3 Intake 1970. I’m trying to obtain a intake group photo/marching out parade photo for/on behalf of my father.
. Looking for any Photos off Gary Thornell. 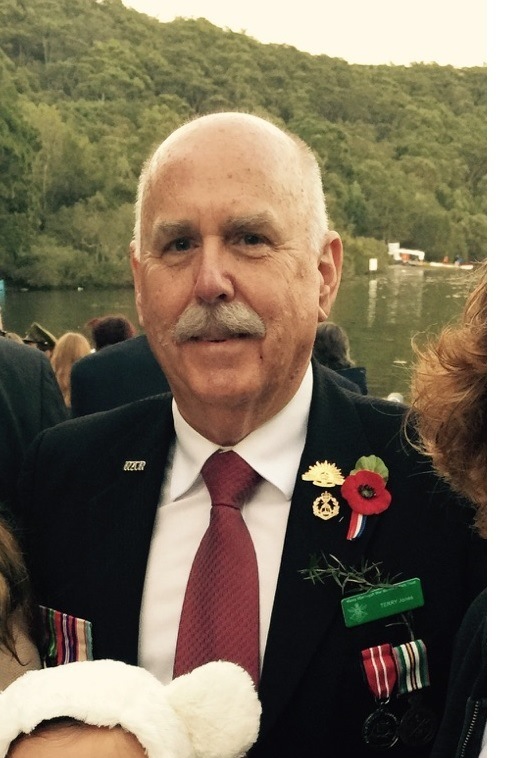 He then went to RAAOC at Bandiana & his Unit was 1COD & from there he went to Vung Tau from April 1970 to August 1970. Hi Graham Scott here Looking for old Platoon Members for help. I hope that i can get some contact with my former nasho's with whom I was in camp at Pucka in May 59 intake B Company 7th platoon? My memory is a bit sketchy on the finer details of names,those who I do remember are as follows-Stewart Skeene Danny Waugh,Paul Tonna,other names are only surnames,being Simpson Sheenan Sgt.Fisher Cpl.Wardley,all the rest are a blank,maybe,just maybe someone who reads this may shed some news or pictures of us during that time,I would be most grateful for any info as I am doing a book on my Army service for the grandchildren. My name is Bob Summerville. I am recording the oral history of Maj Sid Penhaligon, MBE (Rtd). Sid Penhaligon served as a National Service Cadre Staff with 12 Bn, C Coy, in 14, 12, and 13 Platoons, from 1951 to 1953. He was probably a Bombadier or Sergeant at the time. I would be grateful to hear from anybody who remembers him or who has photographs of intakes or training from the period. Contact me on (02) 6238 2435, Mob 0414 77 3435, or by email on ua.ten.dnopgib|strsp#ua.ten.dnopgib|strsp. Hello my dad is looking for intake photos of 2RTB 1st intake 1971 pucka. If you have or know of where we could get a copy of these would be wonderful. If you could find A company 3 platoon and let me know as soon as possible thank you. The first intake was in July 1965, 2nd intake Sept 1965, 3rd intake Jan/Feb 1966, 4th intake Apr 1966, 5th intake July 1966. There were 4 intakes a year. Jan, Apr, July and Sept. The 1st intake finished in July 1967 when the 9th intake was called up, 13th intake was July 1968, so the 17th intake would be July 1969, 21st July 1970 and so on. I was 9th intake at Pucka in July 1967. Does anyone knows the numbering system?? Do you know how the “numbering system” of the 2nd National Service scheme worked because I am confused. I have friends who all say they were in the 13th intake (in 1968) at Pukka but the 13th “draw was in 1971 ???? My name is Lynette James. Ex wife of Keith Daniel O’Connell, residing in Midland at the time of joining the Nashos. He was in the 7th Platoon, B company 13th intake on the 20th August 1955, which incidentally is his birthday, in 3rd field artillery 17 batalion, in Swanbourne West Australia. I He is now 79 years and I am anxious to get him a photo in this period for our children. I have combed the internet on many sites but cant find any of his particular period . My phone number is 0892796233 or0419917816 and Keiths is 0893715361 or 0407381294 if you wish to verify this. Can you suggest anyway I may be able to do this. Thanking you very much Regards Lynette James, 6 Brunel Place Morley 6062. Keiths address is Unit 8/8 Hunt Place Maylands 6051. My name is Kylie Flentjar-Hay. I am the daughter of Daryl Flentjar. I have been looking for photos of my dad. He has been diagnosed with cancer and is in the last stages, he has been able to go home with palative care and the RDNS. i am after anything that i can use in the tribute to his life at his funeral. we have some photos that he took during his time in Vietnam but none of him. do you know if anyone has any other photos. I would appreciate anything that you can track down. Looking photos of my Singleton rookie days if any one has photos could you please contact me. Unit Singleton; A Company 2 Platoon . Our next Reunion will be in Victor Harbor SA next April. It's only a few weeks, now, until the opening of Stage 2 of The Vietnam Veterans Commemorative Walk. Things are going well - the plantings of simulated rice paddies and rubber plantations are almost done and everything is coming together. I'd love to catch up with you on the day, if you'd like to say Hi! I'd really like to take this opportunity to pay tribute to the many, many people who have helped me in my volunteer work for the Vietnam Veterans Commemorative Walk during the last three years. As some of you know, I was asked by the Committee for The Walk if I would be interested in assisting them. I was in the interesting position of being a civilian, not a veteran, female at that, and someone who had no knowledge at all of the Vietnam War. This meant I could tackle the task given me with absolutely no bias, and my idea was to write the storyboards from just the veterans' point of view. Since that time, I have worked closely with the Committee, researching and designing the storyboards and the maps, and also assisting with the creation of The Wall. I would like to thank the Committee for asking me to participate in such a wonderful project and for their support of my endeavours. I'd like to thank my family for their tremendous support over the last several years - I couldn't have done it without you. I'd like to thank John Phoenix, a committee member and himself a Vietnam veteran, who mentored me throughout this project- he never doubted my abilities and has been a great support to me from the very beginning. Thank you, JP. I'd like to say thank you to my partner, John Blackwell, also a Vietnam veteran and a volunteer who has worked closely with the Committee. John has been my absolute strength throughout this project and he, too, never doubted my abilities, even when I doubted myself. Through the nightmares and the many difficult times, he picked me up and helped me push on. Thank you, Sweetheart. Thank you to all of the civilians, and the currently serving military personnel, who assisted with my research. You were absolutely fantastic to work with on this project. Thank you to all of our sponsors and donors who have been so important to our ability to create The Walk. Thank you to the New Zealand Government and also to the New Zealand veterans - your enthusiasm for our project has been wonderful and your assistance greatly appreciated. New Zealanders were an integral part of the Australian effort during the Vietnam War and I'm glad you are represented in The Vietnam Veterans Commemorative Walk here in Seymour. I hope you will be proud of what we have created. Most importantly, I'd like to thank the Australian veterans who've assisted me in my endeavours over the last three years. Your enthusiasm for this project, your generosity of spirit, and your passion for the things you care about, are inspiring. Your quiet but strong patriotism and love of this wonderful country of ours underscore everything you do. Every one of you made time to assist me when I asked, even though you have your own endeavours and community projects to fulfill. I have thoroughly enjoyed working with you on this project and cannot begin to tell you how much I appreciate your assistance. Someone said to me not too long ago that he was very proud of the young men and women he served with in Vietnam. I replied that he could also be very proud of the men and women you are now. It's been an absolute pleasure to know all of you, to hear your stories, see your photographs, to be able to help you share these things with generations to come. I'm tremendously proud of all of you and I hope you will be proud of what we've all created together. 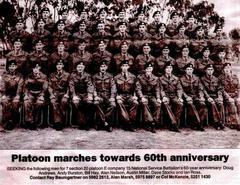 Platoon Marches Towards 60th Anniversary. **All work and updates done by. I am looking for Platoon Photo for~ John Abercrombie. 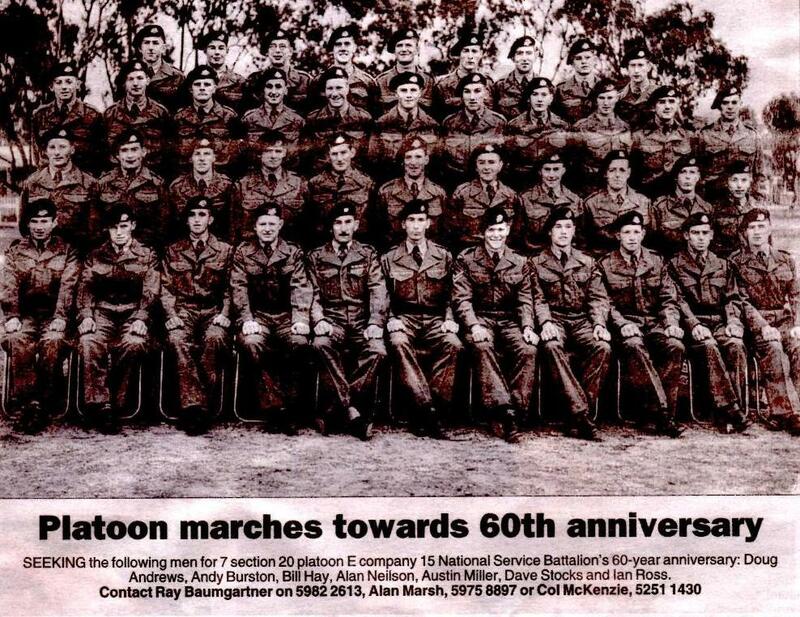 17 platoon D coy 3rd intake 1957 at Wacol. I am searching Photo of my Father from when he was in the Army 61years ago details are as follows Name Lawrance John Mellross better nown as "Joe" from Carpendiet, as small Farming Community near Colac, Service Number 3/743620, so he was in the 3rd Intake .23rd April 1952 to 29th July 1952 , i belive the 15th National Service Battalion "Infantry", E Company and i belive 19 Platoon, if i could obtain a good clear Photo Copy of his Platoon that would be great as i am trying to put together a Frame of his Military Service, for a supris gift for his 80th Birthday this September, so any help in this matter would be fantastic, of course i would be only to happy to pay for any services redndered! Many Thanks and Many Warm Regards.